We will offer the following real property at auction at the farm located from the Jct. of I-29 & W. 12th St. in Sioux Falls, SD (Exit #79 on I-29) – approx. 16 miles west on Hwy. #42 (W. 12th St.) and 1 mile north on 455th Ave. to the SE Corner of Parcel #1; from Humboldt, SD Exit #374 on I-90 – 7 miles south on Hwy. #19 to the Pumpkin Center Corner on Hwy. #42, 1 mile west on Hwy. #42 and 1 mile north on 455th Ave.
Auctioneer’s Note: This auction presents a great opportunity to purchase 2 well located parcels of land that has been in the Kueter Family for decades and consists of 2 distinctly different parcels of land, each with desirable amenities, as Parcel #1 is well suited for row crop farming and Parcel #2 has a combination of a unique potential housing site with terrific viewing opportunities of wildlife, as well as some great hunting and recreational potential. This is an extremely interesting offering of rural property which has many excellent amenities, some of which are extremely difficult to find in rural Minnehaha County, SD, that will be of interest to a variety of buyers. This property has a very good location within minutes of Sioux Falls, SD, other area communities and points of interest. Please mark your calendars and make plans to attend this auction! PARCEL #1 – Consists of +/-128.88 Surveyed Acres – Legal Desc. : The SE ¼ of Sec. 7, T. 101N., R. 52W., Minnehaha Co., SD, Except the N. 669.29’ or the W. 1,462.78’ thereof; and Exc. Tr. 2A of Kueter’s Add’n. contained therein; and Exc. a portion commencing at the SW corner of the SE ¼ – thence east 40 rods, thence north 20 rods, thence west 40 rods, thence south 20 rods to the beginning. This is a break-out off of a larger parcel, thus FSA information is estimated and not guaranteed, although subsequent to the recent survey of the property it contains a total of 128.88 acres, subsequently preliminary calculations based on FSA information, it appears that Parcel #1 has approx. 122.3 acres of cropland and an estimated FSA 58.6 acre corn base with a 144 bu. PLC yield and a 47.9 acre soybean base with a 42 bu. PLC yield; additionally this farm has 3.40 acres enrolled in CRP at a rate of $301.21 per acre which generates a total annual payment of $1,024.00 per year with the contract scheduled to expire on 9/30/2026. Information obtained from Surety Agri-Data, Inc. indicates this land has a very respectable Productivity Index of an 80.4. According to Minnehaha County Planning & Zoning Parcel #1 has a total of 3 remaining rural housing eligibilities. The cropland acres on this farm have been enhanced by the installation approx. 5,000’ of drain tile that was installed in this land by Loosbrock Drainage in 1999, with some additional tile added in more recent years. This property wraps around and excludes one housing site and the St. Joseph’s Wellington Catholic Cemetery – both located in the SW corner of the property and also around 22.48 acres in the NW corner of the property that was sold to a family member that owns the adjacent NE¼. The current non-tillable acres on this farm consist of the existing CRP, waterway and roads. The general topography of the cropland on this farm is level to gently rolling. T-M Rural water has lines running along 264th St. on the South side of the land and along the east side of the land on 455th Ave.; for information concerning availability & cost, contact T-M Rural Water @ 605-297-3334. This farm would make an excellent addition to an area row crop farming operation or investment. This parcel is an extremely rare find, as parcels of land with a potential site for establishment of a rural acreage, combined with a combination of scenic and recreational amenities all in one parcel is difficult, if not impossible to find in today’s market in rural Minnehaha County, SD. This parcel has a cropland area in the NE corner of the parcel, which according to FSA info. has approx. 5.99 acres of cropland which is assigned a small 1.12 acre corn base with a 144 bu. yield; this area could potentially be a superb location for establishment of a rural acreage and for the utilization of the 1 remaining M’haha. County rural housing eligibility that is included with this parcel of land, the remainder of this parcel of land that lies south and west of the potential housing site is nearly all water & wildlife habitat which is under a perpetual WRP easement which prohibits filling, burning, draining and other restrictions and limitations, although this nontillable wetland allows for viewing of a myriad of wildlife and provides areas for wildlife production for the owners private hunting habitat – inclusive of waterfowl, pheasants deer and other wildlife. The hunting and recreational aspects of this property are enhanced by the fact that this land is situated near other large existing US Fish & Wildlife Production Areas that are located within a close proximity of this property. The new owner will need to install a driveway for access to the cropland/potential housing site, as the existing access is through a driveway on the NE ¼. According to Minnehaha Community Rural Water existing lines are located at the Jct. of 263rd & 456th Ave./Hwy. #19; additionally TM Rural water is in the vicinity serving the farmstead in the same section at 26325 455th Ave. – for information concerning availability & cost, contact M’haha. RW @ 605-428-3374 or T-M Rural Water @ 605-297-3334. If you are in the market for land with a variety of attributes including – a potential housing construction site, along with areas with hunting & recreational prospects, then make plans to inspect this property. TERMS: Cash – A 10% non-refundable earnest money deposit on the day of the sale and the balance at closing on or before February 1, 2019 w/full possession for the 2019 crop year. A Personal Representative(s) Deed will be conveyed and owners title insurance will be provided w/the cost of the owners policy divided 50-50; also a closing agents fee, if any, will be divided 50-50 between the buyer & seller. All of the 2018 RE taxes payable in 2019 will be paid by the estate. 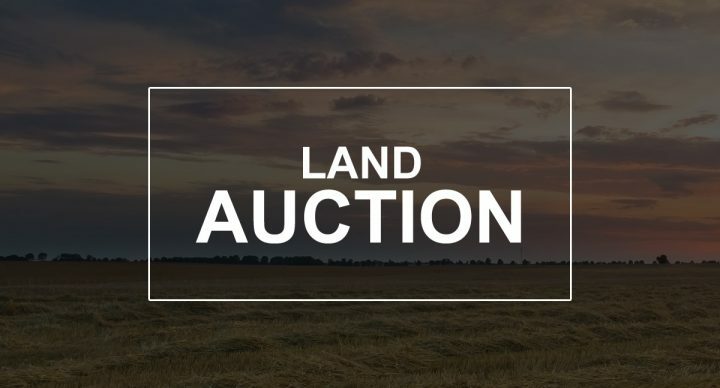 The acres in the respective tracts are based on surveyed acres as determined by Midwest Land Surveying, Inc., with the survey costs paid by the estate. The sellers do not guarantee that existing fences lie on the true and correct boundary and any new fencing, if any, will be the responsibility of the purchaser(s) pursuant to SD Law. The buyer will receive 100% of the payment on the CRP acres payable in 2019 with no proration, and will be obligated to succeed to the contract and comply with all the remaining terms and provisions of the existing CRP contract; furthermore any buyouts or penalty due for cancellation or non-compliance with the terms of the CRP contract will be the responsibility of the new owner(s). FSA yields, bases, payments & other information is estimated and not guaranteed and are subject to County Committee Approval. Information contained herein is deemed to be correct but is not guaranteed. This property is sold in “AS IS” CONDITION and subject to any existing easements, restrictions, reservations or highways of record if any, as well as any or all Minnehaha County Zoning Ordinances. The RE licensees in this transaction are acting as agents for the sellers. Sold subject to confirmation of the Co-Personal Representative(s). 264th St. & 455th Ave.